When it comes to planning a wedding, you only have one chance to do it right. You will be faced with a lot of choices and decisions in a very short period of time. Whether you are choosing a reception hall, a band, invitations, menu or decor, the choice can become overwhelming. Weddings are Gayle’s specialty and she can help you navigate the planning process and relieve some of the stress during what should be one of the happiest times of your life. 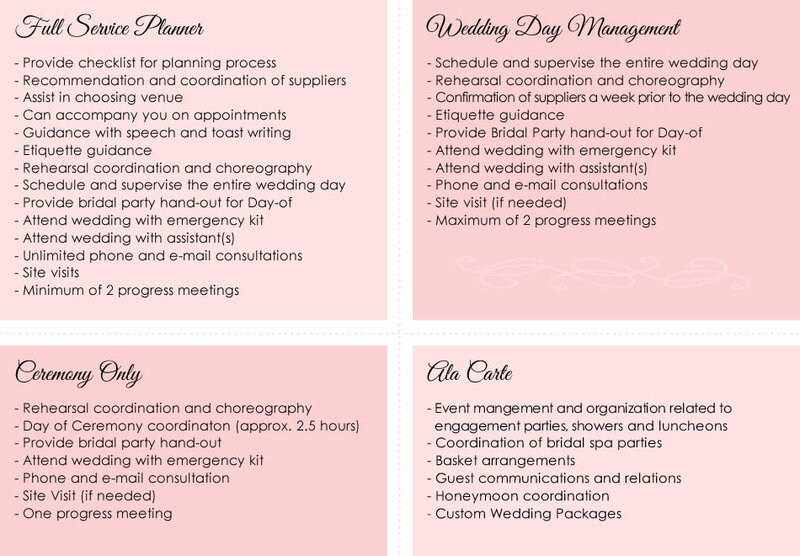 In addition to her consulting packages, she offers a la cart planning services for Engagement Parties, Bridal Showers and Luncheons. Gayle is also available to help with Out-of-Town Guest Arrangements and Honeymoon Travel Coordination.